Successfully Added SoundPad Tablet PC + Bluetooth Speaker - Android 5.1, 7 Inch Tablet, 3000mAh Battery, Up To 90dB, HDMI to your Shopping Cart. We’ve come to expect a lot from Bluetooth speakers, but some products still manage to “wow” us. The SoundPad is a speaker, a tablet and an Android TV box all in one. All the multifunctionality is nicely packed into a sleek portable wireless form, making the SoundPad arguably one of the most practical accessories ever made. What’s in it for you? Let’s find out. Feel like having a relaxing time with some soft tunes or want to keep up the energy level when doing the housework by blasting the latest from your favourite rock band? Just connect to the SoundPad from any Bluetooth enabled device – task accomplished. What’s more, the speaker comes with 8GB of internal memory and boasts an external memory support of up to 16 GB. So it can play your favourite music all on its own. However, there is so much more than music to the SoundPad. 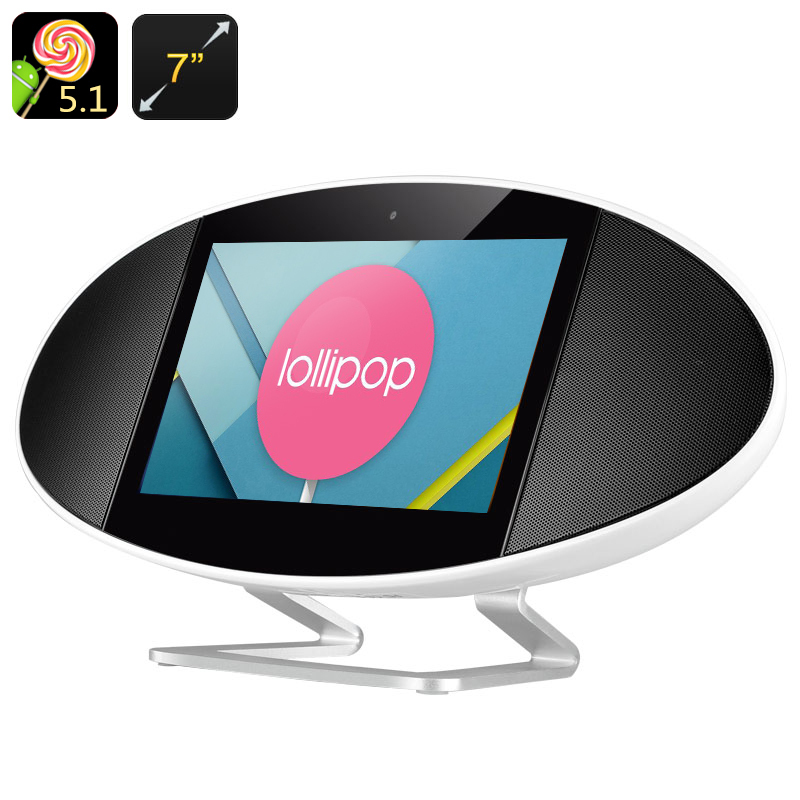 The speaker can easily double as a creatively shaped Android tablet – it has all the specs for it. With the intuitive Android 5.1 OS, you can get apps from the Play Store, watch videos, chat with friends and lots more. Featuring a camera, the speaker can be easily used for both audio and video chats - and thanks to its portable design, you can hold the conversation anywhere you want, and even multitask as you do it. Never again shall you be bored while making dinner or doing home repairs. Just set up the speaker on the counter top or desk, and have your favourite sitcom characters keep you company. Need help? Load up on instructables or recipes and get free professional advice when you need it. Your TV will love having the SoundPad around. Plug it in via the built-in HDMI port and enjoy the familiar and super convenient Android interface on the big screen. Stream your favourite TV series, invite friends over for a movie night or show off your vacation photos in style. The SoundPad comes with a remote control, so you won’t have to get up to switch between channels or adjust the volume - get used to diverse hassle-free entertainment with the SoundPad. The SoundPad comes with 12 months warranty. Brought to you by the leader in electronic devices as well as wholesale Bluetooth speakers and Tablets, Chinavasion..